People walking are five times as likely to be killed by a driver traveling 30 mph as one going 20 mph. 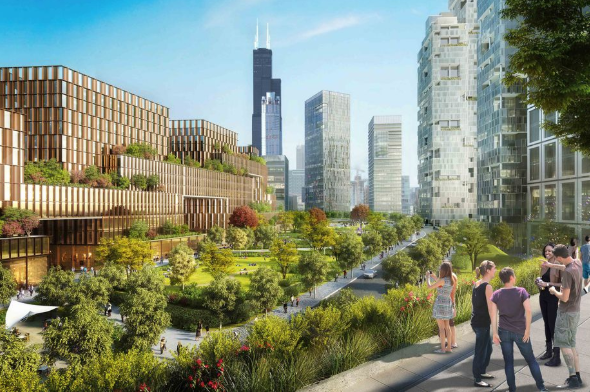 The planned mega-development along the South Branch of the Chicago River, known as the 78, moved a step closer to reality as Chicago’s Community Development Commission recommended tax increment financing to pay for streets and public works upgrades for the project. This 62-acre project will add 10,000 housing units and create a big opportunity to prioritize healthy and sustainable transportation. While the 78’s master plan has some promising ideas for transportation, we think with some key changes the 78 would benefit walking, biking and transit. Much like Lincoln Yards on the North Side, the 78 offers a valuable opportunity to add trails, moving the city closer to a 27-mile continuous Chicago River Trail. A trail would promote walking and biking while supporting healthy communities, cleaner environments and a vibrant local economy. The 78 comes at a key moment when the city is studying a Chicago Riverwalk extension from Lake Street in the Loop south to Ping Tom Park in Chinatown. We’re pleased the 78’s plan includes a 100-foot setback between buildings and the river. But we’re disappointed the master plan includes a single multi-use trail instead of separated paths. Especially in dense areas, separate space for people walking and biking creates a comfortable and safe experience for all users and encourages more people to walk and bike. Along with progress on a Chicago River Trail, the 78 should enhance rail and bus service in the area. In a positive step, the plan calls for adding a CTA Red Line Station at Clark and 15th Street, filling in a mile gap in service between the Roosevelt and Cermak-Chinatown Stations. However, while the project renderings show buses, details on bus service improvements like dedicated lanes, transit signal priority and pre-paid boarding are missing from the plan. The plan also includes new streets with the potential to dramatically improve connections between neighborhoods on the Southwest Side. These include: a new Wells-Wentworth connection, an extension of 15th Street between Clark and Wells and a new “LaSalle Street” from Roosevelt to 15th Street. It’s essential these new roads have dedicated space for pedestrians, bicyclists and public transit. The 78 misses an opportunity to add sorely needed affordable housing by proposing to build half the units off-site. We agree with concerns voiced by residents and advocates that increasing the availablity of affordable housing should include building those units on site, which would ensure transportation improvements are shared equitably. So where is the 78 in the approval process and how can you get involved in the fight for healthy transportation? The TIF recommendation passed by the Community Development Commission now goes to the City Council Finance Committee for a vote. We’ll continue to monitor the project and provide updates. Please click here to join the campaign for a continuous Chicago River Trail. Image courtesy of Related Midwest. For over 30 years, Active Trans has been a leader in making Chicago a better place for biking, walking and public transportation.